WOVEN was formed in 2003 by writer Peppy Barlow, actor Pauline Dent and writer/actor Dawn Rose. In 2007, a third writer, Sally Wilden became an Associate member. WOVEN is dedicated to developing and producing new writing in the East of England, with particular interest in work by women writers.WOVEN has been the recipient of grants from Arts Council England (East) and enjoyed ongoing support from the New Wolsey Theatre, Ipswich. 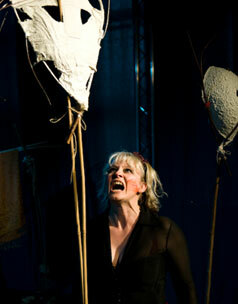 WOVEN has created five successful shows: Grasping at Shadows (2003), Missing (2004) both of which toured in the East of England, Broken (2005), Trojan Whores (2007) at The Courtyard Theatre, Hoxton, London and Philip Thicknesse: Friend or Foe, a site specific production at Landguard Fort, Felixstowe (2017). WOVEN is now looking to tour work nationwide. Members of the company run workshops in theatre and writing skills. Dawn Rose is also a solo performance artist. Mike Kwasniak and by kind permission of Jon Harris. Otherwise by Sheard Photography.